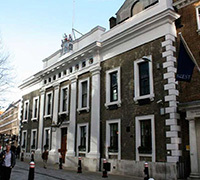 Armourers’ Hall is a unique and ideal setting for all types of functions such as stunning banquets, loan signings, financial presentations, receptions, wine tastings, formal and informal luncheons etc. The smaller rooms can be used as break out rooms for conferences, intimate luncheons or dinners and a special setting for meetings with that very important client. To enquire about a party at this venue.